A financial power of attorney can be helpful if you are going to travel for an extended period. In that case, you could authorize someone to manage routine transactions in your absence, such as paying bills and withdrawing cash if your business needs it on hand. Otherwise, a bank could refuse to offer these services to someone if you merely request that the bank make these transactions without the power of attorney. The document can grant broad powers, letting the agent perform any transaction the principal has the authority to perform. 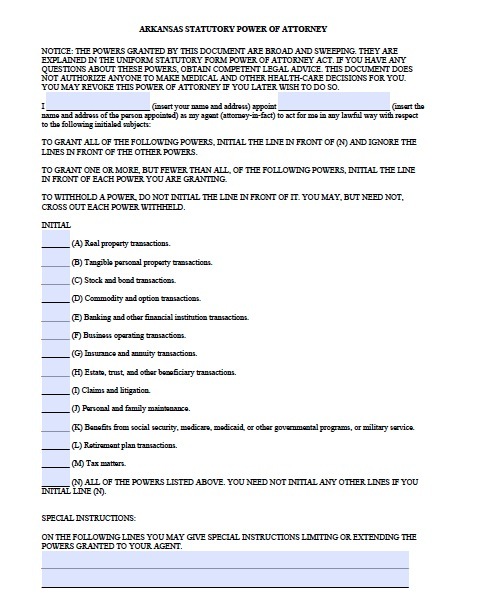 This is called a general power of attorney. You can also use a limited power of attorney to specify that the agent may only do one type of transaction or multiple types. In Arkansas, there are some powers the document must grant specifically in order for the agent to be able to exercise them. These include granting gifts, amending or revoking a trust, and delegating power of attorney to another agent.